Fog paintings and plasma-filled glass tubes are the results of Studio Swine's residency at Brooklyn creative hub A/D/O, where the designs are currently on display. The Wave Particle Duplex installation, which opened to the public last week, showcases the work that Japanese architect Azusa Murakami and British artist Alexander Groves of Studio Swine have created during their six months at A/D/O. Influenced by the duo's experiences of New York City's constantly changing environments, the kinetic artworks blend high-tech processes with natural phenomena. The installation is setup within a closed, white cuboid volume in the A/D/O atrium. 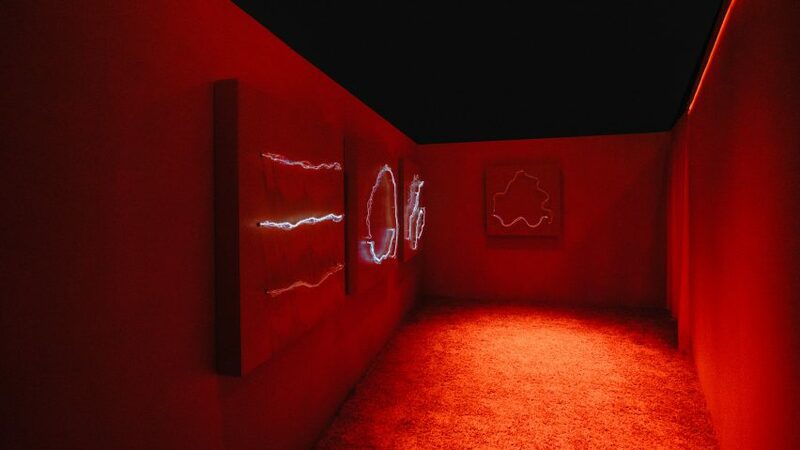 Visitors walk in through a doorway and along a dark, doglegged corridor before arriving in an entirely red room. This space exhibits Dawn Particles: a series of four wall-mounted panels that hold blown-glass tubes containing plasma. "Plasma is the fourth state of matter after solid, liquid and gas," Murakami told Dezeen. "It's the most abundant material in the visible universe. Lighting is plasma, the sun is plasma, the aurora borealis is plasma." The plasma is formed by krypton gas held in a low-pressure vacuum. Voltages controlled by algorithms are periodically pulsed through the tubes to create varying light effects. "We've been through laborious processes to test lots of different gases, but krypton was the only one that gave this specific effect," Murakami said. The organic shapes of the glass also play a part in altering the shifts in light, with some areas appearing cloudy, and others bouncing the tiny bolts back and forth. The tubes also create a ringing sound as they resonate. Through a curtain, the second space is decorated all in yellow. This room hosts two "fog paintings", which Studio Swine created to emulate traditional landscape paintings but using contemporary tech. "We're really interested in how artists like Turner, or Thomas Cole from the Hudson River School, would use the sun and the effect through our atmosphere as a vehicle for transcendentally finding spirit in nature." Both are housed within clear acrylic vitrines and attached to the walls. In one, a motorised light moves in a wave motion behind a layer of different coloured gels, and another layer of fog. The other features several light sources set behind dichroic glass cubes, which rotate to refract the light into ever-changing spectrum of colours. Fog also shrouds the components to further disperse the point of illumination. "It's somewhat akin to if you zoomed into a tiny molecular scale to water droplets in the sky when it's splitting light to make a rainbow," said Groves. Building on their work with materials, like the New Spring installation that produced scent-filled bubbles, the duo described this new body of work as "ephemeral tech". "We love technology, but we love materials more," Groves said. "We're always interested in what's the material interface that we have with technology." "We haven't worked with light really before, but when we got into plasma, it was something we were really interested in because of the molecular behaviour," he added. Wave Particle Duplex will remain on show until 10 February 2019 at A/D/O, which was set up by car brand MINI as a space for the creative community. Studio Swine is the third to undertake the Designer in Residence programme, following London architecture collective Assemble – which set up a clay-extruding factory – and New York designer Stephen Burks. Dezeen also hosted a talk with Studio Swine at A/D/O in October 2018, in which the duo discussed the future of technology, art and design.